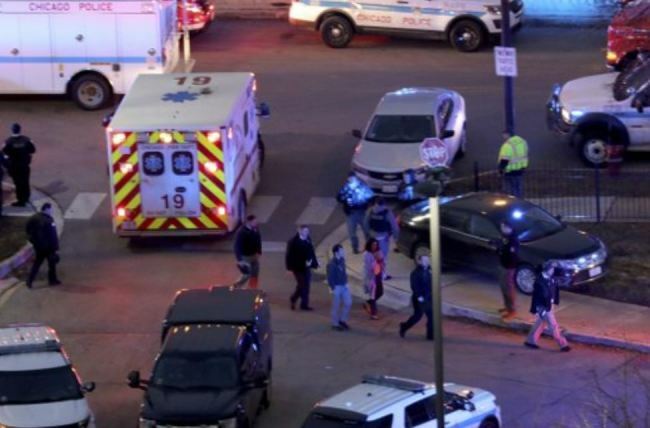 CHICAGO (AP) -- A gunman opened fire Monday at a Chicago hospital, wounding at least four people, including a police officer and a hospital employee, authorities said. A police spokesman said the gunman was dead, but it was not immediately clear if he took his own life or was killed by police at Mercy Hospital on the city’s South Side. The shooting apparently began as the suspect was walking with a woman near a parking lot. He turned and repeatedly shot the woman in the chest. He then entered the hospital and continued firing, Gray said. The two had been talking to each other in what Gray said did not appear to be a heated exchange. “Then once she fell to the ground, he stood over her and shot her three more times,” he said. Four people were in critical condition, including an officer. At least one of the four was a hospital employee, police spokesman Anthony Guglielmi said. Television footage showed several people, including some wearing white coats, walking through a parking lot with their arms up. Jennifer Eldridge was working in a hospital pharmacy when she heard three or four shots that seemed to come from outside. Within seconds, she barricaded the door, as called for in the building’s active shooter drills. Then there were six or seven more shots, now much closer, just outside the door. “I could tell he was now inside the lobby. There was screaming,” she recalled. The door jiggled, which Eldridge believed was the shooter trying to get in. Some 15 minutes later, she estimated, a SWAT team officer knocked at the door, came in and led her away. She looked down and saw blood on the floor but no bodies. “It may have been 15 minutes, but it seemed like an eternity,” she told a reporter. Maria Correa hid under a desk, clutching her 4-month-old son, Angel, while the violence unfolded. Correa was in the waiting area of the hospital for her mother-in-law’s doctor appointment when a hospital employee told them to lock themselves in offices. She lost track of how many shots she heard while she waited under the desk, “trying to protect her son,” for 10 to 15 minutes. “They were the worst minutes of our lives,” Correa, a Chicago resident, said. Dennis Burke, who lives across the street from the hospital, was getting off the bus when he heard six gunshots and saw officers nearby with their guns drawn. “I dropped my groceries,” Burke said. He ducked behind the bus for cover and watched as 50 to 100 people poured out of the hospital, including a victim on a stretcher. A message left for hospital officials was not immediately returned. Mercy has a rich history as the city’s first chartered hospital. It began in 1852, when the Sisters of Mercy religious group converted a rooming house. During the Civil War, the hospital treated both Union soldiers and Confederate prisoners of war, according to its website.